A software plug-in incorporating Jünger’s Level Magic™, providing a very comprehensive audio processing package for all loudness monitoring and control applications. 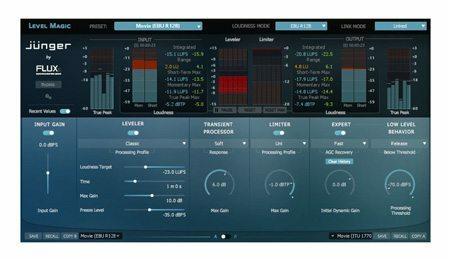 The plug-in is compatible with all common DAW platforms and the processing is fully compliant with all current Loudness standards. Numerous loudness management processors are also available from Jünger in hardware form: the D*AP4 and D*AP8 platforms support a variety of I/O and software options to suit all broadcast applications; the COMPACT high-density range is able to simultaneously process large numbers of channels. Jünger’s acknowledged expertise in loudness management is now available as a software plug-in. The Jünger Audio Level Magic™ plug-in provides the same extensive range of audio processing, ease of set-up and almost complete absence of artefacts as their hardware units. The Level Magic™ plug-in is fully compliant with the recommendations of ITU-R BS.1770-1, 2 and 3, EBU R128 and most other international standards. The plug-in is suitable for use in all DAWs compliant with VST, AAX Native and AAX Audiosuite plug-in formats on either Mac or Windows-based systems, or AU formats on Macs only. Compatible operating systems are Windows XP, Vista, 7, 8 or later, and Mac OSX 10.7, 10.8, 10.9 or later. 32- or 64-bit operation is allowed in all cases except with systems running on WinXP, or ProTools 10.3.5. 64-bit operation in ProTools 11 is supported. Two versions are available – two-channel for mono or stereo operation, or 6-channel for 5.1 surround. Level Magic™ effectively implements an AGC section, a transient processor and a brickwall limiter in parallel to ensure that all possible out-of-range level excursions are captured and controlled. The result is guaranteed adherence to the selected loudness standard with almost complete audio transparency. This is particularly important when changing programme sources, as any audio level differences are removed. The single-page GUI is highly logical and visually represents the signal flow through the various processing stages. Input level is displayed to True Peak and Loudness scales; further meter displays show the action of the leveller and limiter, followed by an output meter section, again showing level to True Peak and Loudness scales. Instantaneous, Short-Term and Integrated Loudness readings are displayed for both inputs and outputs in numerical form. Simple controls are provided for input gain, leveller parameters, and the various limiter and transient control functions. Software activation is via a USB dongle or iLok user account.